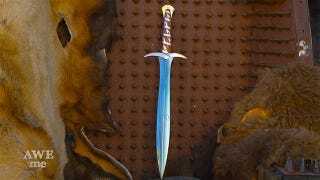 Master swordsmith Tony Swatton—who also made Wolverine's claws and Thor's hammer—just forged the famous Sting, the ancient elvish blade that glows blue when orcs and trolls are near. Swatton's version can cut like the real thing and glows blue too, thanks to his amazing technical prowess. Sting was the blade used by Bilbo and Frodo Baggins in Tolkien's classics The Hobbit and The Lord of the Rings.